Dhaka Bank Limited has been accredited as ‘Bank of the Year – 2018 in Bangladesh’ for banking excellence from THE BANKER. THE BANKER’s Bank of the Year’ Awards are regarded as the OSCARS of the Banking Industry. For the last 92 years, THE BANKER has been the world’s leading monthly international financial affairs magazine owned by The Financial Times Ltd, UK. The Banker Awards Ceremony was attended by more than 350 Bank Chairpersons, CEO’s, CFO’s and other senior managers from over 120 countries. During the Ceremony, Award Winning Crest was handed over to Mr. Syed Mahbubur Rahman, Managing Director & CEO of Dhaka Bank Limited. 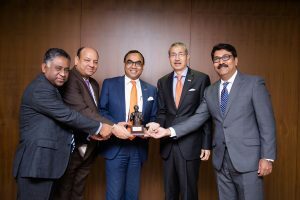 The recognition of being named as ‘Bank of the Year – 2018 in Bangladesh’ by the world’s longest running international banking title is testament to the strong management, sound business model, banking innovations and prudent risk approach of Dhaka Bank Limited.